Milford is filled with amazing arts and culture opportunities, with more populating this lovely town each year. Here’s one more to enjoy. 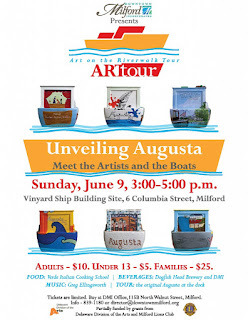 The Art on the River Tour (ART) Project will unveil six sculptures on Sunday, June 9, from 3:00-5:00 p.m. at the Joan and Sudler Lofland's Vinyard Ship Building Site, 6 Columbia Street in Milford. The featured sculptures are Phase 1 of the public art project which features 4-foot sculptures of the classic yacht Augusta built by the Vinyard Ship Building Yard in 1927. The sculptures will be displayed permanently along the Mispillion River and throughout downtown Milford over the next 3 years. A total of 18 sculptures (6 per year) is the goal of the project’s organizers. The artists were commissioned to create based on the theme "River Town. Art Town. Home Town". Five of the six boats were created by Anne Jenkins, David Rule and Cathy Walls, and one was decorated with mosaic tile by Scott & Gail Angelucci — all Milford professional artists — with assistance by Milford High School students Ann McGehrin, Evelyn Orta, Carlo Rodriguez and Kim McKinney. 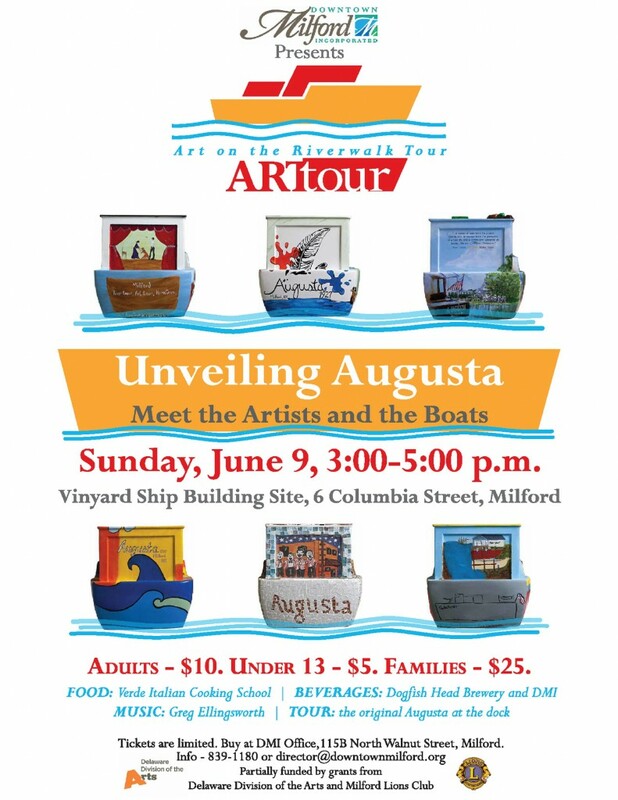 The unveiling will be followed by a meet-the-artists reception, and the original, fully renovated Augusta will be at the dock for tours. Tickets are $10 adult, $5 children under 13 at a maximum of $25 per family. Tickets are limited and are available at the DMI office, 115B North Walnut Street, Milford. For more info, contact Lee Nelson at 302.839.1190, e-mail Director@DowntownMilford.org or visit the Downtown Milford website.